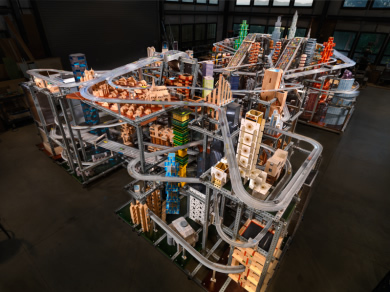 The Los Angeles County Museum of Art is currently exhibiting Chris Burden's Metropolis II , a 20-by-30 foot, multi-storied installation circulating 1,100 toy cars about 100 times over 18 traffic ways at scale speeds of 230-240 mph each hour. In Metropolis I, Burden employed approximately 80 Hot Wheels, which wore out quickly because of the flimsy axles. For Metropolis II, toy cars were custom-built to endure the wear of speeding through the cityscape three times a week indefinitely at LACMA. Chris Burden. Courtesy Gagosian Gallery. Photography by E. Koyama. Courtesy of the Nicolas Berggruen Charitable Foundation. My first thought upon seeing the scaled down city was that somewhere in the display room, a little boy's heart had exploded in euphoria. Every hour 100,000 cars cycle through the structure, and although the frenetic noise--high clicks, the rush of plastic and metal--creates tension, the impulse is to get very close and peer into the intricate tangle of urban life: high rise buildings with glittering glass panes emerge through the intricate network of roadways; HO scale trains glide across tracks about 16.5 mm wide, moved by electric currents; the toy cars race, stabilized by dividers, slow under thick brushes (the kind you'd find at a car wash) and are pulled up steep grades by magnets until they are released to the strong pull of gravity and momentum once again. Chris Burden. Metropolis II. Photography by Robin Tung. The roadways range from two- to six-lanes and at all times, a controller continuously checks lanes to make sure that cars don't pile up or malfunction on any of the tracks. Museum visitors recorded the installation and snapped photographs; many climbed up the stairs to view Metropolis II from the second story. Each angle offers a different impression of the kinetic cityscape. Chris Burden, who started out as a performance artist, believed early on that art should not be pure object or "things that you could simply sell and hang on your wall" but "ephemeral and address political, social, environmental and technological change." In an interview with John Pavlus for Co.Design, Burden said about the cars: "Toys are interesting as objects -- they're the tools you use to inculcate children into adults." 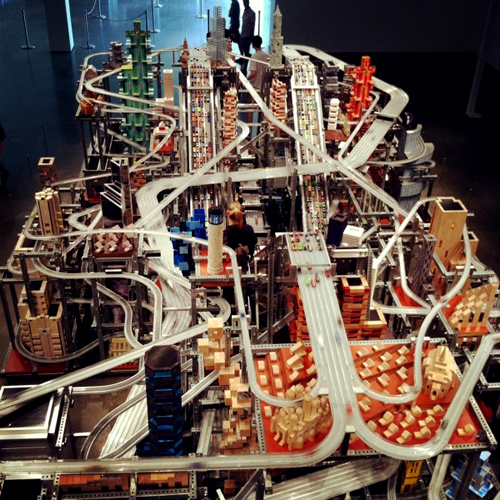 Chris Burden created Metropolis II in his Topanga, California studio and spent four years working on it with an engineer. "What's really stressful is the stop and go; high speed, low speed; where it speeds up and slows down," Chris Burden said in a short documentary by Henry Joost and Ariel Schulman. "It wasn't about making a scale model of something. It was more to provoke the energy of a city." Metropolis II is now on view four times daily each Friday, Saturday, and Sunday at the Los Angeles County Museum of Art where his Urban Lights is also on permanent display. Robin Tung is a contributor for Daily Serving and The Montreal Review. She received the 2006 Milton A. Saier Award in Fiction from UC-San Diego, a 2011 Pushcart Prize nomination, and a 2012 honorable mention from the New Millenium Writings Award.